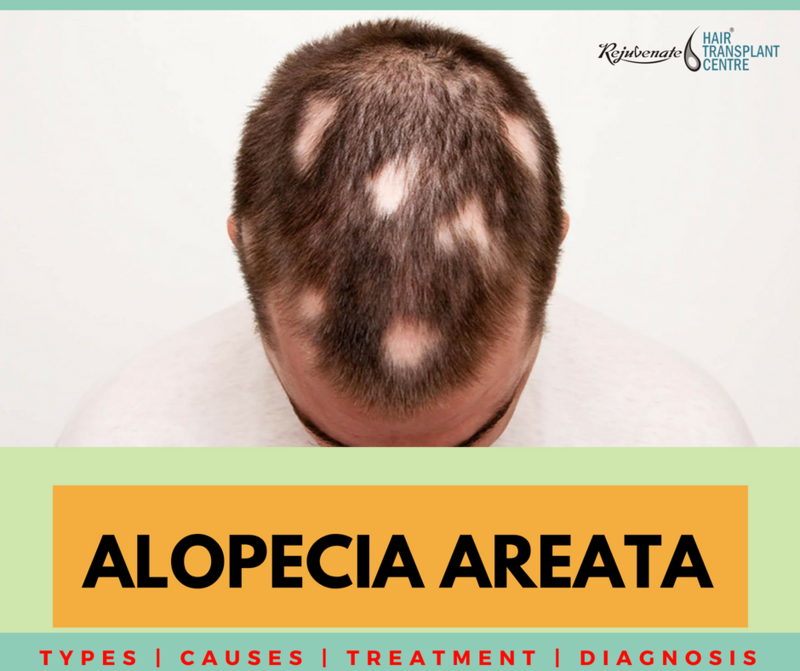 Alopecia areata is a complex genetic disease and is considered an autoimmune disease which usually targets anagen hair follicles. This disease usually affects the hair loss in children and adults. It is characterized by round or oval patches of hair loss. In many cases the hair re-grows, typically after several months. In some cases, the hair loss is permanent. Experts have two explanations, it could be triggered by a hereditary predisposition or it could be caused by an autoimmune disorder. This type is identified by its patchy appearance. This term is reserved where the sufferer is experiencing patchy scalp hair loss from many years. This patchy alopecia areata starts from the scalp and it can happen anywhere in the body. Alopecia Universalis entails gradual total body hair loss. It starts on the scalp and spreads to the face and the rest of the body. In this all the body hair, pubic hair, face and head hair is lost, sometimes it may include eyebrows. In this type, people lose all the hair from the scalp. As it is slightly different from alopecia universalis. The body hair is not lost in this, only the scalp area of hair loss. It is a rare autoimmune disease and genetic role is present. This condition is typically the advanced form of alopecia areata. This form of alopecia areata is limited to the beard. A patch happens in the beard and it is obviously found only in men. The person experiences small hairless patches in the beard in a circular form. Diffuse alopecia areata is also known as alopecia areata incognita. It looks like a form of hair loss and mostly seen in young women. It is a sudden hair loss and unexpecting thinning of scalp hair. It doesn’t have any patches on the scalp nor in the body. This problem is harder to diagnose because it causes hair fall and it creates a confusion with telogen effluvium. This is one of the rarest forms of alopecia areata and it is tricky to treat. As it shows a unique pattern of hair loss and usually begins at the very back of the scalp, close to the nape of the neck, and spreads behind the ears to the crown of the head. In the above, we know that it is an autoimmune disease and evidence suggest that when their is an abnormality in the immune system then it occurs. As a result, the immune system attacks it’s own healthy cells on its own body. In alopecia areata, for unknown reasons, the body’s own immune system attacks the hair follicles and disrupts normal hair formation. It is not known why it is common for only certain areas of the scalp to be affected. Also, the affected hair follicles are not destroyed. Affected hair follicles are capable of making normal hair again if the immune reaction goes and the situation returns to normal. It is not known why alopecia areata or other autoimmune diseases occur. It is thought that possible triggers include viruses, infection, medicines or other environmental factors may develop autoimmune diseases. Consult a doctor if you are experiencing significant hair loss. There are many reasons for hair loss. Your doctor can only understand your pattern of hair loss and guide you for further treatment. The problem can be diagnosis during a biopsy, a small piece of tissue from the scalp is removed and studied under a microscope to understand why hair is falling out. There is no permanent cure for alopecia areata as it is a very unpredictable condition. If their is a small bald patches like one or two then many doctors doesn’t provide any medical treatment as it will grow back within a few months but if the small patches are on a larger area of the scalp then a doctor may prescribe steroid injections or PRP. It many cases it shows that these treatment help to regrow hair. Nowadays many hair transplant centre are using PRP method in alopecia areata and shows the effective result in many patients. Follicles still have potential to regrow hair. Alopecia often begins in childhood. The hair loss isn’t permanent. Some effective treatment like Injections and PRP help in Alopecia Areata. Imbalance of psychological effect on both men and women. Stress is a major trigger. A healthy, balanced diet can help sufferers.